Hello again! Hope you've all had a wonderful week, despite the rain that some of us can't seem to escape. The good news is that the weather is finally right in Pennsylvania for plump, sweet cherries. Shockingly, this was never something I cared about until, well, yesterday. Before now, I just couldn't get excited about these early summer treats, but the specimens that showed up in my CSA share from Kauffman's Fruit Farm changed my mind. In fact, they were so delicious that I decided to put them in a pretty bowl and take a photo for you. Sadly, by the time I got out my camera, my fingertips were stained red and the majority of the cherries had mysteriously disappeared, with only a lonely half dozen or so remaining. Still, I think they look quite lovely. Despite my recent love-affair with these sweet fruits, I don't think I could be convinced to eat them any other way then straight off the stem. I'm sure some of you would beg to differ... How you would rather have them? As an aside, we've got a few fun things in the works for Fresh, so check back at the end of this week and early next for a summer surprise and a very good story for the coffee lovers among us! Kitchen notes + See you in a week! In about an hour, my hubby, JK, and I are unplugging from the world and heading up to his family's cabin to enjoy an entire week of swimming, hiking, relaxing and soaking up the sun (if the weather holds out). In fact, as I type JK is behind me haphazardly tossing most of his clothes into a duffel bag. The fact that he can do that in about five minutes, while I have to spend two days carefully planning everything I will need, is another story entirely. Yes folks, after months of searching, we have acquired a vintage chalkboard for our kitchen. 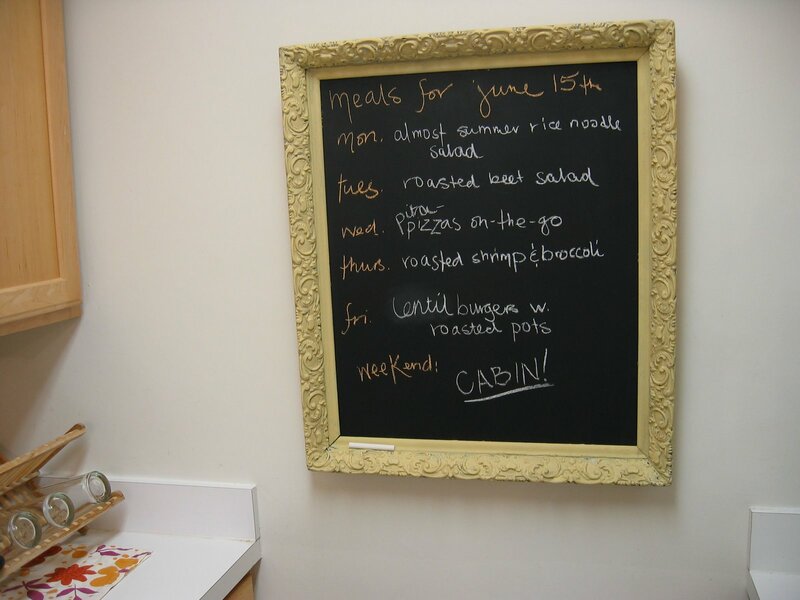 Granted, it's less portable than the blue notebook, but seeing this chalkboard hung in our lilliputian kitchen makes me very happy. Already, it's inspiring me to find new ways to use the bounty of our bi-weekly produce share. If there are others of you out there with little things that make you happy in the kitchen, I would love to hear about them here! So on that note, have a lovely week all and I will look forward to seeing you again next Tuesday! In the meantime, check out this awesome story about the growing trend of roof gardens from The New York Times earlier this week... And a thank you to my dear friend Jo for pointing it out to me! It has been established that I enjoy my milk products. So it's no surprise that yesterday's conversation on Civil Eats about the future of dairy farms in America caught my eye. The original piece is a reaction to the sharp drop in dairy prices that is endangering American farmers, who are now being paid roughly half of what it costs them to produce milk. Not surprisingly, the cause involves the economic slow-down. When the recession hit late last year, many dairy farms were expanding to meet the growing worldwide demand for milk products. As we all tightened our belts, the demand fell and dairy farmers found themselves knee-deep in a surplus. At the same time, we saw a loss in our milk product exports according to the U.S. Foreign Agriculture Service, and an increase in milk product imports. By late 2008, the dairy industry was in trouble. The Civil Eats post mentions that the price drop is worst for conventional and small to mid-sized farms, but a recent New York Times piece explains that the organic dairy industry is being hit at least as hard, as farmers who made big investments to go organic are now watching their cash-strapped consumers return to non-organic milk. I'm cringing at the idea of losing 80% of our dairy farms by the end of the year, a loss that would make us increasingly dependent on huge dairy operations and foreign imports, and I am in absolute agreement that action needs to be taken to avoid that outcome. Unfortunately, the problem is reaching a critical mass and the solution will most likely need to come in the form of an immediate increase in subsidies. That said, I feel strongly that these subsidies be a temporary solution, the last thing we want to see is a dairy industry that looks like our model for growing and subsidizing corn. The future of our small, medium and organic farms depends on an economically sustainable solution, and as Farm Aid's Hilde Steffey points out, "Ultimately, what our dairy farmers need is a complete overhaul of the milk pricing system: one that incorporates the national average cost of production, a fair living wage, and an inventory management mechanism designed to address overproduction as needed. Furthermore, the Department of Justice must tackle unchecked anti-trust violations and excessive control in the industry to ensure a pricing system that is fair and transparent for dairy farmers, processors and consumers alike." So while subsidies are an important temporary answer, it's crucial that we look ahead for a creative and economically viable solution... The future of our ice cream depends on it. If you're interested in making your thoughts heard feel free to share them in the comments below, or click here. Friends, I have a problem. It involves rhubarb. Aside from a few appearances in a Strawberry Shortcake cartoon, I've had little to no experience with this spring vegetable. In fact, I cannot remember ever having eaten rhubarb before in my life. Cut to three weeks ago and my first CSA pick-up of the season (more on that later). Amidst the bounty was a ripe bunch of reddy-pink rhubarb. It was a busy week, with not much time for experiments in the kitchen, so I tucked the stalks away in the crisper draw to save for later. In the meantime, I searched some of my favorite baking sources for the recipe the would provide my first taste, never mind preparation, of rhubarb. Though I came across a ton of recipes, my mind kept wandering back to two options. One, a classic; strawberry-rhubarb crisp. Never a big pie fan, (unless it's my grandmother-in-law's famous chocolate pie or anything my friend Ann puts in her delicious graham-cracker-crust) I am a devoted lover of crisps and cobblers. Couple that with the aforementioned rhubarb and the truckloads of plump strawberries that I've been impulsively buying recently, and that's shaping up to be a serious late spring dessert. My plan would be to use the peach and raspberry crisp recipe from the Barefoot Contessa, substituting in the rhubarb and sweet strawberries. 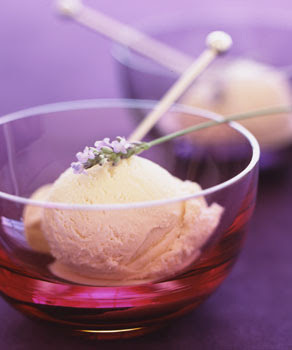 On the other hand, I found a fantastic sounding parfait on Epicurious.com from Bon Appétit last spring. 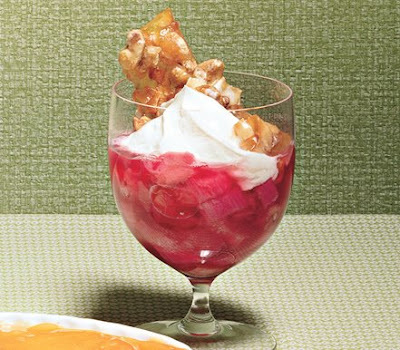 Saute the red stalks into a sweet compote with a hefty dose of sugar and a touch of Chambord, top with Greek Yogurt (or vanilla ice cream if I'm in the mood to splurge) and walnut-coconut candy. Sounds pretty amazing, does it not? And perhaps a bit more friendly for those of us preparing for swimsuit season. So help me out here folks... The rhubarb has been patient up to this point, but it won't wait much longer. Which recipe should I go for?